Lilly Shappel Park is located on the east rim of the Aliso and Wood Canyons Wilderness Park in the City of Laguna Niguel. The slope works best in West winds but works well in winds ranging from WNW to WSW and there is a lot of thermal elements in the lift. Steep 240′ west-facing slope. The top landing area is mowed grass, but it’s narrow and surrounded by expensive homes. 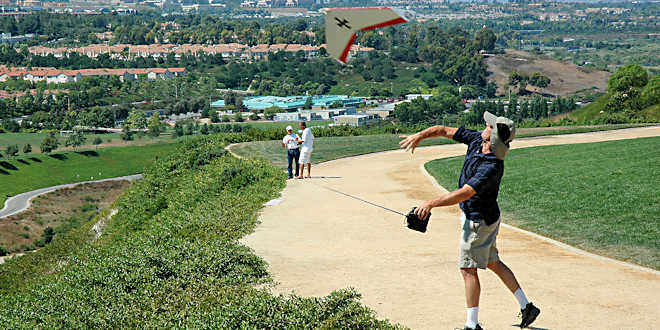 The preferred place to land larger and faster planes is on the face of the slope near the top rather than on the grass. Starting point: Junction of I-5 & Crown Valley Pkwy. 33.55919,-117.67315 – Junction of I-5 & Crown Valley Pkwy. 33.54183,-117.71503 – Junction of Alicia Pkwy & Highland Ave.